Designed by anySCALE and winner of a Red Dot Award, Beijing’s POLYPHONY made its first foray into conventions and festivals by bringing a booth to the Wonder Festival in Shanghai the first weekend of April 2018. 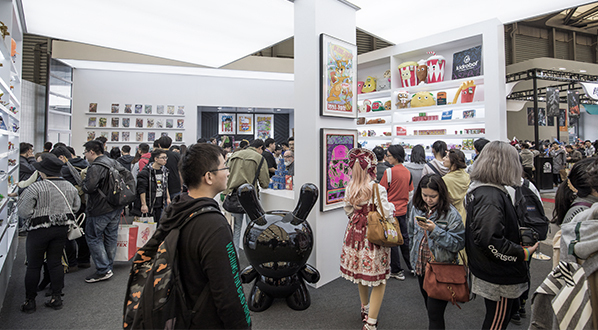 A well-respected fixture in the comics and music scene in Beijing, POLYPHONY’s participation in the Shanghai edition of the Wonder Festival, a biannual event originating in Japan, represented a perfect opportunity to introduce the brand to enthusiasts in east China. Having first begun as a way for anime and manga fans to showcase amateur sculptures also known as “garage kits”, today, the festival is the largest and most prestigious of its kind, and features toy companies and top figure makers presenting their latest creations. POLYPHONY’s booth attracted much positive attention. anySCALE adopted a cost-effective concept that derived from the original Sanlitun store, with the color scheme, lighting, and displays kept similar. This was a significant decision since one of the most striking aspects of the Sanlitun store is the cleanness and simplicity of design. 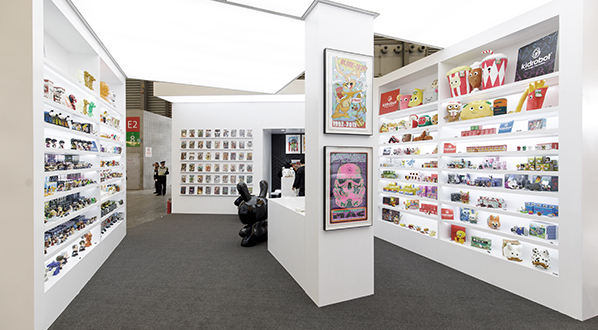 The booth provided a neutral and fresh background that allowed the displayed products to ‘pop out’ with their colors. This also allowed the POLYPHONY booth to stand out and appear distinctive amongst other booths and catch eyeballs. The entrances on both sides were made generous and inviting, and the floor layout was optimized to reduce congestion within the stall. The outer walls of the booth were black and covered in geometric patterns with large backlit POLYPHONY logos, while the interiors were kept pure white, with two massive light panels acting as the booth ceiling. The orange and gold accents from the original store were omitted to keep the focus on display items. The main concerns were to keep a free design concept while ensuring the client’s needs for sales counter and storage were accounted for; given the mutual trust and strong relationship between anySCALE and the client, the project was conducted smoothly. Since POLYPHONY is expanding into the business of industry events and conventions, anySCALE has been onboarded as the design partner for future POLYPHONY pop-ups and stalls at fairs.